UPDATE APRIL 5: April Lynn Parks was a private, professional guardian appointed by Clark County Family Court to protect hundreds of vulnerable people. Parks admitted to Contact 13's Darcy Spears on camera in 2015 that she made major mistakes with her client's money, including in one case, charging an elderly woman $108 for a pair of stretch pants. Parks was the ringleader of a small group employed by her. They've all been indicted for draining the accounts of those they were supposed to care for while isolating them from their families. Parks faces more than 200 felony criminal charges for racketeering, theft, exploitation and perjury. She was arrested in Pennsylvania on March 8, extradited to Las Vegas and booked into Clark County Detention Center Tuesday. 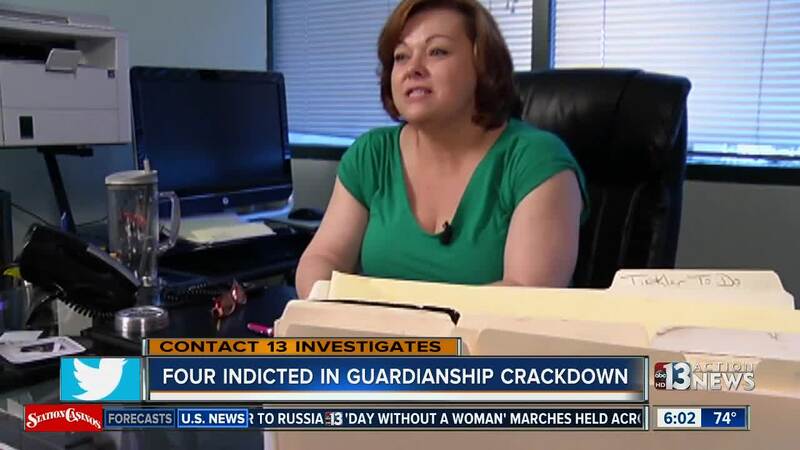 Contact 13's investigation helped lead the way for reform in the guardianship system and the criminal case against Parks. That came just in time as we uncovered in court documents that Parks was about to expand her business and hire more staff. She'd gotten a contract with Valley Health System's six Las Vegas hospitals, which would make her the first choice to refer patients for guardianship services. There's no telling how many of those potential referrals could have fallen victim to the alleged crimes Parks and her associates are charged with. Valley Health Systems declined to comment. Contact 13 requested an on-camera interview with April Parks at the jail but haven't heard back. And we tried to reach her attorney but his voicemail was full. UPDATE MARCH 27: Mark Simmons is now behind bars in Las Vegas. Simmons faces 134 felony criminal charges including racketeering, exploitation of the elderly and theft. He was extradited from Indiana and booked into Clark County Detention Center this weekend. He is scheduled to appear before a judge on Wednesday. UPDATE MARCH 14: Private for profit guardian April Parks is now behind bars. She and three others were indicted last week for running a criminal enterprise involving theft and exploitation. 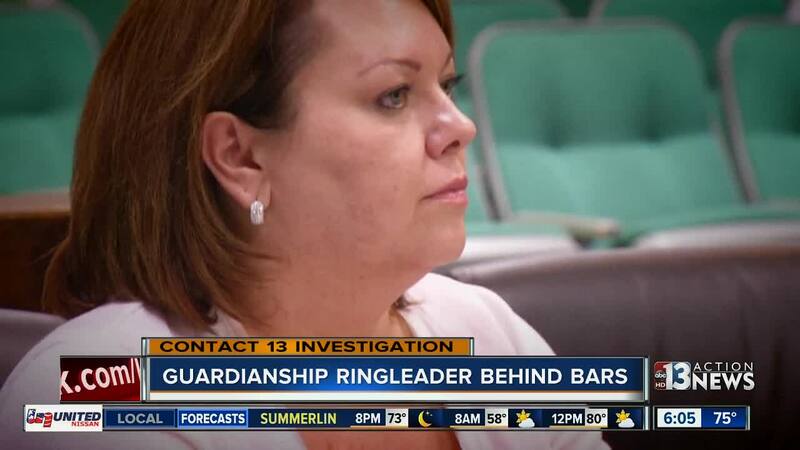 Court records show Parks disregarded her duty as a guardian, treating the vulnerable as "cash cows." In one example, Parks and her business partner Mark Simmons profited from a scam where they bought Christmas gifts for their wards, such as popcorn, socks and other small items. When the wards received the gifts, they were charged at a hourly rate of $100 per hour. Clients were also billed when Parks' husband Gary Taylor drove to the courthouse and waited in line to file papers that could have been submitted online. LAS VEGAS (KTNV) -- What started with a Contact 13 investigation has led to hundreds of felony charges against four suspects for the way authorities say they treated people in their care. It's the most significant guardianship exploitation indictment in Nevada's history -- so says Nevada Attorney General Adam Laxalt in what authorities hope will wipe out a long-standing crime wave in our state. Cheers and fist pumps erupted in the Regional Justice Center lobby from a crowd of people who haven't had much to celebrate over the last few years. "Today, law enforcement sends a clear message to those who take advantage of our most vulnerable citizens," said Clark County District Attorney Steve Wolfson. Contact 13 first exposed April Lynn Parks in early 2015 when she told Darcy Spears, "I do it because I love it," in reference to her work as a private, professional guardian. Guardians are appointed by the court to protect and serve their wards. They're entrusted with every aspect of a person's life, including their health care and their money. "I can't imagine a class of people more susceptible to criminals than wards of a court," said Wolfson. The charges involve more than 150 victims who've lost more than half a million dollars. "I've never been so happy in my life! All the thousands of hours and dollars I put into this was not in vain," said Elizabeth Indig, whose mother was one of Parks' wards. So were Julie Belshe's parents -- Rudy and Rennie North. Contact 13 broke their story in February 2015 . "When I reached out to you I was very traumatized," said Belshe. "I didn't know what to do!" As for Wednesday's indictments, Belshe says, "It restored my faith in the people, in the justice system -- that there are good people in our system that are working and they're on our side -- the citizens' side. Because you start to think, who's going to believe me? Because you tell these stories and they're unbelievable!" "I really think this is going to send a very strong message to the other guardians and the attorneys and the judges who aided and abetted her in this," said Indig. "And I think maybe Nevada will be clean of this crime and people can move here and retire without fear of losing everything." Contact 13 will have more on the Family Court system's role in all this as the report continues on Thursday.